Acupuncture for Pregnancy and Anemia is a very common treatment provides in my practice, generally around week 20. This is because the many cases of infertility and conception problems I see often relate to a deficiency of blood a result of which is the failure of the body to nourish the developing eggs and as such menstruation is often delayed or erratic. Of course when successfully treated and the patients become pregnant there is still a tendency towards a blood deficiency and now with the vast amount of blood being used to create the placenta and nourish the developing baby, it is almost certain there may be symptoms of pregnancy induced anemia. In this article I’ll explain a little more of what Acupuncture for Pregnancy and Anemia covers from both a western and eastern point of view, the symptoms and then suggest some treatment options and dietary concerns. From a Western point of view, anemia is often classed as an “iron deficiency”, however this can be inaccurate as there are in fact a number of types of anemia including but not limited to, iron deficiency anemia, sickle cell anemia, thalassameia, and pernicious anemia. I’ll explain each of these terms in just a moment and how Acupuncture for Pregnancy and Anemia treatments can resolve these issues, but first let’s explain how Iron affects the blood as this underlies all understanding of the various types of anemia. Blood is comprised of red colored cells (blood cells) called hameoglobin among other things at is on hameoglobin we wish to focus. The red blood cell hameoglobin is used to carry oxygen around the body. It is made up of two primary parts, a pigment (giving it the red color) called “hame”. This contains iron and is attached to a protein called “globin”. If there is not enough hameoglobin in the blood, you cannot circulate enough oxygen around the body and thus present with a variety of symptoms such as excessive tiredness, breathlessness on exertion, pallor, heart palpitations and a poor resistance to infection. Of the various types of anemia I mentioned above the most common by far is an iron deficiency anemia. Without sufficient iron the body can’t make enough “hame” for the blood. This can be caused from a Western point of view by a variety of factors such as a poor diet lacking in iron rich foods, poor absorption of iron due to a lack of vital nutrients such as folic acid, B6, B12 and vitamin C, all of which are essential for iron absorption. Sickle cell and Thalassameia are indicative of different racial groups and caused by abnormalities in the hameoglobin. Sickle cell effects those of African origin, while thalassameia effects those of a Mediterranean descent. Finally pernicious anemia, which again is quite common though not nearly as much as iron deficiency anemia. Pernicious anemia is caused by a deficiency of vitamin B12. In general the body lacks the ability to absorb B12 and thus can’t absorb adequate iron. This is most often caused by a poor diet, low in B12 or a dysfunction of the stomach. I have a close friend that actually developed a B12 deficiency as a result of being a long term vegetarian. The most common treatment for this is regular monthly injections of B12. Women are most likely to suffer one of these forms of anemia in the 20th week as blood volume increases, and also around the last 4-6 weeks of pregnancy as the baby begins to lay down its own iron stores. Blood tests to determine hameoglobin count are usually performed around this time, and often at the beginning of a pregnancy as some may have an underlying tendency towards anemia which can be acerbated and triggered by pregnancy. Of course Acupuncture for Pregnancy and Anemia treatments are very useful in most cases but before we look at that it’s a good idea to have an understanding of the traditional Chinese Medical explanation. From a TCM point of view, Acupuncture for Pregnancy and Anemia treatments are categorized primarily by its symptoms – tiredness, palpitations, dizziness, shortness of breath, etc and is thus often seen as an underlying deficiency of Qi and Blood. The two organs most involved with the production of blood in the body according to Traditional Chinese medical theory are the Spleen and Kidneys. The Kidney’s actually are considered responsible for the manufacture of blood as it’s Yin essence is transformed into Blood. This is done in conjunction with the Spleen which transforms food and fluid into Qi and Blood. A weakness in Blood will affect the Heart and Liver in Chinese Medicine which will often show the significant signs and symptoms such as tiredness, palpitations, dizziness, shortness of breath, etc leading to diagnosis. Acupuncture for Pregnancy and Anemia treatments are excellent in treating both the underlying weakness of the Kidneys and Spleen and also the symptomatic weakness of the Heart and Liver in combination with proper TCM dietary advice. Again this is supported with objective scientific evidence, such as the study of Futornyĭ SM. Published in 1997 May-Jun;(3):103-7, the study determined that in a clinical trial of over 30 women Antianemic treatment using acupuncture procedures in pregnant women with iron deficiency anemia was found to significantly activate the state of both cell-mediated and humoral immunity, mobilizing defensive and adaptive bodily reactions, being an efficient option designed to preserve the pregnant women's immunologic tolerance in the system mother-fetus. Obviously diet is hugely in conjunction with Acupuncture for Pregnancy and Anemia treatments and will often be recommend by your primary physician. From a western point of view organic and inorganic iron supplements may be prescribed, however these can often cause constipation and other side effects. In terms of overall diet red meats are simply the best way to take in iron. 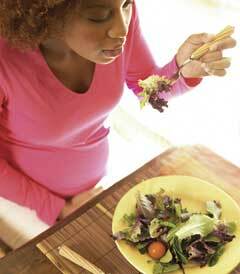 A lesser method is to eat vast (comparable to meat) quantities of leafy greens or spinach. Keep in mind that antacids or heartburn mediation will drastically decrease iron absorption as will tea and coffee. A small handful of dried apricots and pumpkin seeds are a helpful and easy to boost iron intake. From a TCM point of view the Spleen needs to be nourished and strengthened and so I always recommend taking in grains, and warm soups and stews (a good beef stew is ideal!). As is always the case with a weak Spleen I always advocate avoiding too many raw or cold foods as this can have a stagnating effect on the digestive process and decrease overall energy and productivity. I addition, things like Dairy, Sweets, sugar, fruit juice, ice cream and cold fluids, melon, pork and Tofu should be avoided. If you are pregnant and are suffering from anemia or related symptoms I strongly encourage you to undergo Acupuncture for Pregnancy and Anemia treatments to resolve these poor energy levels and ensure your immune system is not weakend. If you have any questions or concerns regarding the Acupuncture for Pregnancy and Anemia treatment protocols that I provide or wish to start a course of treatment then please feel free to contact me or make an appointment where we can discuss any specific concerns or questions you may have. You have been reading about Acupuncture for Pregnancy and Anemia. It may interest you to read about Acupuncture for Pregnancy and Insomnia Here.